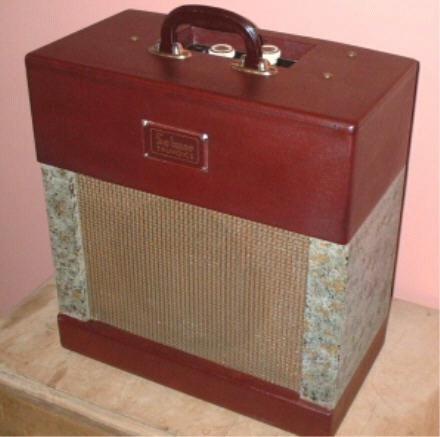 c1958 Selmer TV12 Amplifier owned by Simon Spicer. 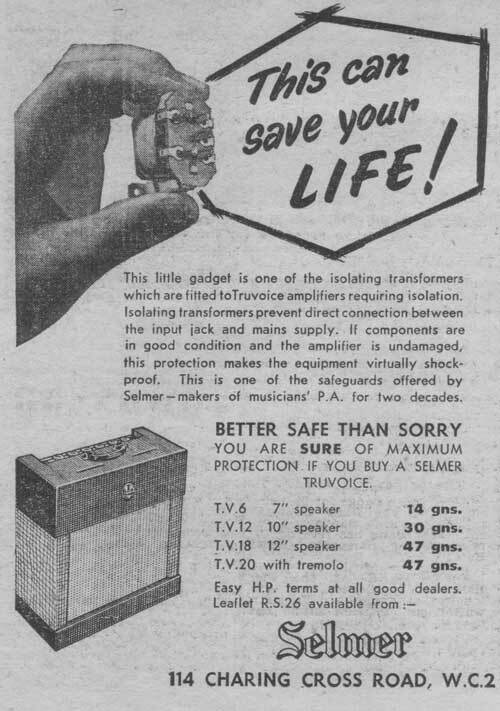 It is interesting to see that this range of "new" amps was advertised as having "built-in isolating transformers, making the amplifier virtually shockproof", a significant improvement on the basic mains rectification of earlier RSA/Truvoice amps. Nick Adams' VIDEO ON YOU-TUBE is strongly advised viewing for owners of the very early Selmer Truvoice amps. Perhaps a later addition to range, as it does not feature in the 1958 catalogue, but is obviously a fore-runner to the TV6 Popular amp in the later Red/Cream period. 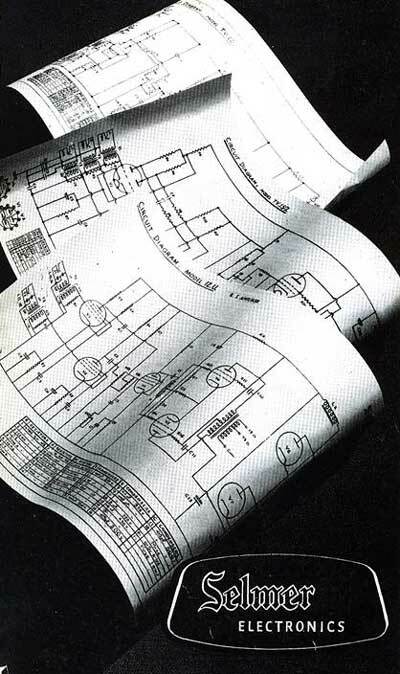 Interestingly, the TV6 Schematic Drawing is dated October 1957, so perhaps it just missed the publication of the 1958 catalogue. It featured a 7" elliptical loudspeaker and provided 5 watts output using 1 x EF86, 1 x EZ80 rectifier, & 1 x EL84. Two inputs, each with there own volume control, and a shared tone control. The amp was stated to have an 8 watt output with 10watts at peak, fed into a 10" loudspeaker. Dimensions: 16" x 16�" x 8�". Price in 1958 - 30gns. Again two inputs, but with a separate volume and tone control for each input. A 12" speaker was fitted for the amps 18 watt (20 watt at peak) output, which was produced by two KT55 valves. Dimensions: 20" x 19" x 9�". Price in 1958 - 47gns. A 14 watt amp that seems to have been influenced by the US amps both with regard to the speakers fitted and the valves used. It had two channels with two inputs, a volume and a tone control for each. However, unlike the other amps in the range, this amp had a tremolo circuit with speed and depth controls. Four 8" speakers were fitted "in line with current American practice". (!) Valves fitted were: 2 x 6V6, 1 x 5Y3 rectifier, 3 x EF86, 1 x 12AX7. Dimensions: 20�" x 22�" x 9�". Price in 1958 - 47gns. Cover of Selmer Electronics 1958 Catalogue, courtesy of Terry Eaton.